By 1930 Rudhyar was lecturing widely and writing at great pace on a broad range of topics. Some of his work during that period found a home in The Glass Hive, a "new thought" magazine edited by Will Levington Comfort. Much involved in theosophical and occult activities, Will Levington Comfort (1878-1932) first made a name for himself as a war correspondent, and in 1931 had a minor hit novel titled Apache. In June 1930, Rudhyar married Comfort's assistant, Malaya Contento. 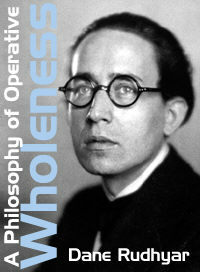 A Philosophy of Operative Wholeness is an eight-part series, appearing in The Glass Hive from November 1930 through June 1931. It is significant and noteworthy for a number of reasons. It is probably the first philosophical statement regarding Wholeness. Although Rudhyar had used the term "Wholeness" throughout the 1920s, the series is far more comprehensive than anything published before it. Holism and Evolution by Ian Smuts, a book of a more scientific, and almost entirely biological, orientation, had been published two years earlier, but Rudhyar did not become aware of it until 1932. Nevertheless, this series probably represents the first comprehensive statement of Wholeness in the broad, more than biological, sense it is generally understood today. A Philosophy of Operative Wholeness also focuses more closely on the concept of the cycle than most of Rudhyar's earlier work, though cycles and cyclicity played a central role in Rudhyar's outlook and philosophy since his 17th year. Later in life, Rudhyar greatly developed his formulation of wholeness in books such as The Planetarization of Consciousness (1970); Rhythm of Wholeness (1982) and The Fullfness of Human Experience (1985). Oneness encompasses all things by denying their separate existence. Wholeness encompasses all things by operating in and through their corporate existence. When the One operates in and through organic wholes for the consummation of wholeness, life is fulfilled. When this operation is "sustained continuously" throughout the whole of time, it extends itself progressively over the whole of space; wholeness is then realized in the absolute. It is realized in the particular when the operation of the One is sustained only for a particular value of time and space; i.e., for a limited period and within finite boundaries. These propositions are the quintessence of the philosophy of operative wholeness. It is not a new philosophy. But it is a philosophy which cyclically requires to be formulated anew. The American continent is being touched again by the cyclic wave. We must formulate anew this philosophy of operative wholeness. This means ruthlessly to scrap all the traditional meanings clinging to terms which we use like parrots; to start from the bottom; to question all words, the betrayers of living concepts; to face the world as it is; to face all the relationships it brings to us; to enter into them, with no fear and no reservation; to be whole in all our doings; to stake the whole of us in the game and be good losers; above all things, to become incarnated in what we do, and to sustain continuously, serenely, any chosen work. For there is only one way of formulating the eternal philosophy of operative wholeness: to live whole. "I Am" � this phrase requires study. America is filled with people who go on proclaiming every day before breakfast: "I am power," "I am wealth," "I am the son of God," etc. On the other hand in India the passionate cry resounds: "Not this! I am not this. I am not this body. I am not these emotions. I am not this mind . . . " Both are right and both are incomplete. America is young. India has been old for a long time. To reach the "I Am" it is necessary to repeat, phase after phase, plane after plane: "Not this. Not this." What is left then? No-thing. No many; only the One, self-satisfied out of all time and space, relating itself to all things; that is, to nature, in that it is everlastingly negating one or all aspects of this nature. For denial is just as much relationship as affirmation. To say, "I am not this" pushes the "this" away, but charges it with negative power to drag me back once more from oneness into multiplicity and to make one say, "I am this." When you say "I am One," do you mean this body, emotions, and mind as a unified organic whole? Or do you think of an abstract "I" which India yearned for passionately; yearned to become abstracted into this absolute "I am" which �is not� nature; to cut away all nature from the abstract Self. This Self is one, but it is not whole, because it leaves out the body or nature with which it is related, either by affirmation or by denial. This abstract One may seem free, but it is not so in reality. For freedom gained by denial is merely the blissful sleep which preceded new thralldom. The sleeper may dream, but he shall awaken to find himself bound by karma, that aspect of Wholeness which ever forces back the dreamer of Oneness into the scattered condition of forms. What is the true relationship of "I AM" and body or nature? On the involutionary path (the path of "pursuit") One relates itself to the Many by apparently scattering itself as the various numbers. "I am this, that, the other thing" . . . "I am power, virtue, health" . . . "I am miserable, sinful." By doing that, the thing or condition to which the One relates itself is made potent, is exteriorized. Then surfeit and weariness stop this identification of the One with conditions and objects. The One begins to say, "I am not this, not that." It is the evolutionary path (the "path of return"), the road to Oneness which is based on renunciation and on negating all save the Self, save the power-realization "I Am". American is plunging into the former path. India was worn out latter by thousands of years of treading. Descent into matter, into relationship; ascent into spirit, out of relationship. This is the Wheel of Existence, the endless circuit , which generates in term, karmically, the two polarities of life. "I Am not this body, but I Am in and through this body for the consummation of Wholeness." Where that is said and lived, mastery begins. The two above-mentioned paths are the paths of Nature. This last aphorism is the path of Man. Do not say: "I Am this or that, good or bad, healthy or unhealthy." Say instead: "I Am in this or that, in a good or evil nature." This "I Am" is not nature. The great illusion, the maya fought by the Hindus for so long, is the identification of the "I Am" with nature, with good and evil. This identification must be broken, but when it is broken the end has not come; on the contrary, only then Man begins. Man is the en-compasser (Manu) and the compassionate (Maitreya) , the thought of wholeness, the energy of wholeness, the manifestation of wholeness. This manifestation of unceasing. For if wholeness were ever unmanifested, the manifested "I" that thinks now would not be included in the wholeness � an absurdity. Wholeness includes any manifestation in the infinitude of time and space. Thus it is always manifested. This manifestation is Man. Thus Man is eternal and changeless. "I Am" operates in and through Nature for the eternal manifestation of wholeness. "I Am" operates in and through microcosm and macrocosm for the eternal fulfillment of Man. It operates through cycles of human development, through this and that civilization. Our task today as personalities is to become the operation of the "I Am" in and through the new cycle of American humanity. This means spiritual action, the work of wholeness. We need not dream or yearn to become One. We need only consciously act to be the operation of the "I Am" in and through the cycle.